So we flew to Hanoi, Vietnam, which only took an hour, instead of getting the bus, which would have taken about 24hours and Dave really wouldn't face that. Once there we began the usual haggle to get a taxi, when a guy came up to us and said he had a mini bus and would take us for 2 dollars each, which was a bargain! Once on the mini bus, this went up to 3 dollars and reluctantly we paid, even though we had agreed 2. We had pre booked a hostel which the driver agreed to take us to. We stopped outside one with a similar name and were confronted with a guy telling us there had been a problem with our booking and we had been moved. Alarm bells started ringing and when we confronted the guy he started telling us about sick children. Completely confused and convinced it was all a big scam, we found ourselves wondering the streets trying to find our real hostel. Eventually we got a rickshaw to take us to our actual hostel and it turned out we were right not to trust the scamming little so and so's. Hanoi is very, very intense, the traffic is out of this world and trying to cross the road was terrifying the first time, we have now learnt that if you just walk out and don't bother looking the traffic goes round you! 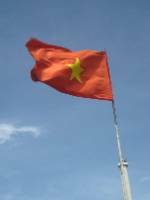 We spent 3 days in Hanoi, taking in the local sights, such as water puppets, history museum, pagodas etc. 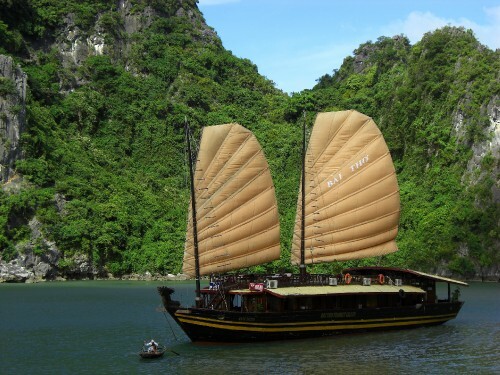 We then went on a trip to Halong bay, where we spent one night on a junk boat, which was pretty cool. We spent 2 days sailing around the bay, stopping off at beaches, going kayaking and visiting caves and monkeys! Our second night we spent in a hostel on Cat Ba island. It was pure luxury with a TV and toiletries in the bathroom, it was all very exciting!! We then took a junk back to Halong bay and caught the bus back to Hanoi. Today we spent the morning shopping, then in the afternoon we went to the prison, which was really interesting, as it was set up by the french during the war. We are currently waiting for our night train to Hue, which is at 11pm. We were suposed to be on the 7pm train but somewhere along the line something went wrong. Hanoi is a very stressful town and having spent nearly a week here, I wasnt all that impressed, the hostel got a drift of this so have kindly booked our accommodation, trips and bus out of Hue at a discount price for us, to make up for the "blip" Hopefully nothing else will go wrong!